If you are piecing together a list of the top 5 online tournament poker players in the world, then in my opinion you would have a hard time constructing a list that doesn't includes "apestyles". According to thepokerdb, "apestyles" has over 400k worth of total tourament earnings since January 1st, 2006. Disgusting! That also includes a number of huge scores, including a $135k score in November of last year, plus numerous tourament wins. Also, this doesn't include "apestyles" $100R win from earlier today. Apestyles works extremely hard on his game, and isn't afraid to stick his money in when he knows that he has the best of it. Even better, Apestyles is helpful and posts some very analytical posts on message boards such as pocketfives.com. 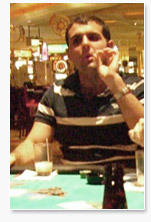 In our opinion, Apestyles is one of the top 5 online poker tournament players around today.